Diving in the Red Sea was an exceptional experience the first time, so I decided to go again, on a different trip, during my off month in-between jobs. Needless to say, it was another exceptional experience. Ok, the arrival was a bit confusing to me. Was the visa included or not, I had gotten contradicting information. Finally, it was, and I should have seen the guy with an A4 sign and a faded "Diving Attitude" sign. He was also shouting my name in various parts of the arrivals in Hurghada airport. There were tons of people though, and we never met until it was too late. In the end, another dive instructor was getting Jenny and another lady from the airport (our dive instructor for the trip). So basically, I had a private lift in Hurghada to the marina. 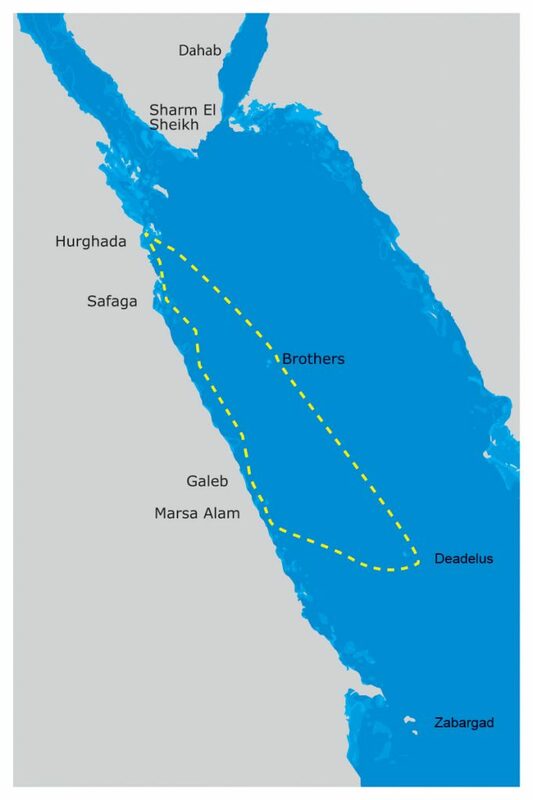 The Golden Triangle stands for Brothers, Daedalus and Elphinstone, the major reefs visited. These are located south-south-east from Hurghada, on reefs far off the shore. The sea was a bit rough at points, and the cupboards in our cabin were creaking. Most of us spent the first or second night without proper sleep. The rest of the nights were spent in calm waters, just behind protecting islands and/or reefs. This is the trip marked my first close-up encounters with sharks. The first close-up encounter (at an arms length close) was with a longimanus shark which we found under our diving boat. They like roaming close to the surface, under boats, looking for scraps and fish. On the second dive, I tempted Eric, my diving buddy for the week, to go below our boats, see if we found some sharks and possibly other marine life under the boats instead of looking at small marine life on the reef. He readily agreed, and thus began the epic part of this adventure. Hanging on the boot lines of a couple of boats between 10 and 15 meters depth, we managed to escape the crowds. One longimanus seemed to enjoy that and came to check us out. The second encounter was with a hammerhead shark at 28 meters depth. We spent an easy shallow dive on one of the reefs, when we suddenly spotted it below us. Most of the others were already around 10 meters, coming up from 40 meters. I decided to go down there and check out if it wanted to stay a bit. It did, and it came by really close for a couple of times, until it decided to elude me by hiding behind a rock and escaping. I never saw in which direction. I was looking out to see if I saw the Nautile Evo from Anthias Plongée, and I finally saw it on Elphinstone. They did the St. Johns tour, which seems to be a bit low on life these times. Below, the video I made.